Jersey City teachers out on strike | Fight Back! Jersey City, NJ - On March 16, public school teachers in Jersey City, New Jersey went on strike after months of frustrating contract negotiations with the city’s Board of Education. 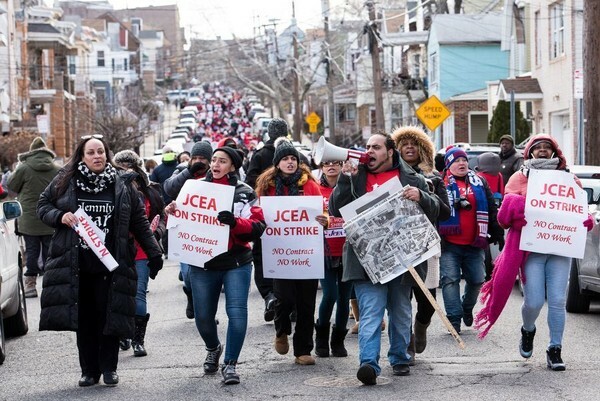 Their union, the Jersey City Education Association (JCEA), announced the strike to their nearly 4000 members late on the night of March 15. Teachers began showing up to picket lines and rallies across the city before 5 a.m. – mere hours after the strike was officially announced. The Jersey City Board of Education attempted to bring in substitute teachers as scabs to break the JCEA strike, offering to pay them double the normal per diem rate. Far from undercutting the strike, the move only furthered the resolve of teachers and staff districtwide. The board decided not to cancel school, instead insisting that classes continue with a 12:45 p.m. early dismissal. But, their decision backfired since there were far fewer substitute scabs available for the school day to proceed normally. However, the Jersey City Board of Education’s biggest miscalculation was to underestimate the level of student solidarity with teachers and school staff. Casillas continued, “Students walking out with our teachers felt like the right thing to do. As the child of a JCPS employee, the battle these teachers are fighting is personal. It affects my family every day. Our teachers have our back. They support us as not only teachers, but as mentors, confidants and sometimes like parents. The student-teacher relationship is so important. So now it's time we help them." According to the union, the strike centers on two key issues: the “fight for affordable health care and a fair contract settlement.” The JCEA and the Board of Education have met more than 20 times for negotiations since their contract expired Sept. 1, 2017, with little progress and harsher cuts to teachers’ health insurance plans demanded by the school district. Later in the day of March 16, the JCEA led a march of several hundred teachers and students to the Board of Education building, demanding a fair contract and no cuts to teachers’ health insurance. Like the West Virginia teachers who won their statewide strike earlier this month, JCEA has organized food drives for students and families that rely on free and reduced breakfast and lunch programs through the public school system. While the Board of Education’s refusal to agree to a fair contract led to the strike, the root issue is a series of cuts proposed to teachers’ health insurance plans. Budget cuts and austerity measures passed under former New Jersey Governor Chris Christie have devastated public education funding in the state. School districts like Jersey City are enforcing these budget cuts by forcing teachers to pay more out-of-pocket health care costs and reducing the quality of their insurance plans. The Jersey City teachers strike comes on the heels of a nine-day statewide teachers strike in West Virginia, which ended in that state’s legislature passing a 5% raise for teachers and other public workers. West Virginia teachers faced deep cuts to their health insurance and placed humiliating burdens on teachers to keep their coverage. There, the state legislature demanded budget cuts for the same reason that Jersey City’s Board of Education cites: responding to budget shortfalls, which were created by giving tax breaks to corporations, millionaires and billionaires. 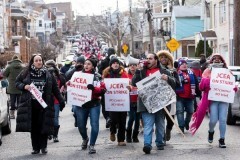 While public employees can legally strike in New Jersey – unlike West Virginia, where public sector work stoppages are illegal – the militancy of the JCEA is part of a strike fever sweeping teachers across the U.S. Budget cuts and givebacks demanded by state and local governments have pushed teachers to the limit, forcing many to strike out of necessity. Teachers unions in Oklahoma, for instance, have set April 2 as a tentative deadline for the state to pass greater funding for public education or face a West Virginia-style statewide shutdown. This strike fever among teachers unions happens against the backdrop of the Supreme Court’s looming decision in the Janus v. AFSCME case. The court is expected to rule against unions and implement right-to-work-for-less laws across the country for public employees. This ruling will weaken public sector unions by allowing workers to reap the benefits of union membership – raises, contract protections, health insurance, pensions and more – without joining or paying dues. Public sector unions are a key pillar of the U.S. labor movement, making up just under half of all union members. In 2017, 34.4% of all public-sector workers were union members (7.2 million), versus just 6.5% in the private sector (7.6 million). The Janus case is the latest attempt by anti-union billionaires like the Koch brothers to break the back of organized labor. But while the Janus decision will hurt organized labor, especially public-sector unions, the militancy of the teachers in West Virginia, Jersey City, and Chicago – who held a one-day strike in 2016 – shows a path forward. With the law stacked against them, the teachers in West Virginia blatantly violated the anti-union laws restricting their right to strike, and they won. They demonstrated that these laws are written by and for the 1%. In reality, workers hold the real power. Even in a post-Janus world, unions can grow stronger and win through workplace militancy and struggle. FightBack! will continue covering the Jersey City teachers strike.